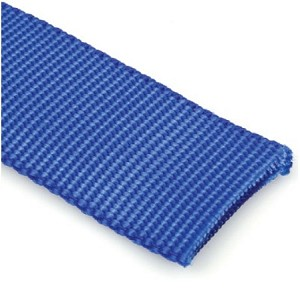 1.1 mm Nylon Webbing - Blue is a strong and durable type of webbing excellent for outdoor marine applications. It has excellent abrasion and UV resistance. Nylon webbing is commonly used in making sports products, dog leashes, luggage straps and safety belts. 100% Nylon Fibers, 840 Denier. Standard Heat and UV Radiation stabilized. Catch cord applied. Cautions: Synthetic webbing's are best cut with a hot knife or singed with a lighter to ensure sealing of the edges to maintain integrity of the weave. Passes Motor Vehicle Safety Standard 302 Fire Code. I would call it a pacific blue that matches Sunbrella pacific blue quite closely.